(Steve Griffin | Tribune file photo) Riders disembark a train at the Farmington FrontRunner Station, Nov. 17, 2014. In a perfect world, the Utah Transit Authority would love to double-track and electrify its FrontRunner commuter rail system to allow trains to run every 15 minutes and operate more efficiently. But in a meeting with regional planners on Wednesday, the UTA Board heard that projected taxes, fares and grants won't allow that until far in the future, if ever. “We don’t have enough money to build everything we need,” said Sean Seager, director of planning for the Mountainland Association of Governments, a regional planning agency in Utah County. Seager and Ted Knowlton, deputy director of the Wasatch Front Regional Council in northern Utah, said their agencies have been carefully studying financial resources and needs for highways and mass transit through 2050. And money for many of the hoped-for major FrontRunner improvements just isn’t there anytime soon. But if planners tell legislators and other policymakers “what the need is, they may find a way to rise to the occasion and build that,” Seager said. Currently, most of FrontRunner runs on single tracks. It is double tracked in a few spots to allow trains to pass each other. However, if a train in one direction is delayed, it may back up all traffic. Also the few spots with double tracks limit the frequency of peak service to about every 30 minutes, and officials would like to offer every-15-minute service to serve growing population and needs. 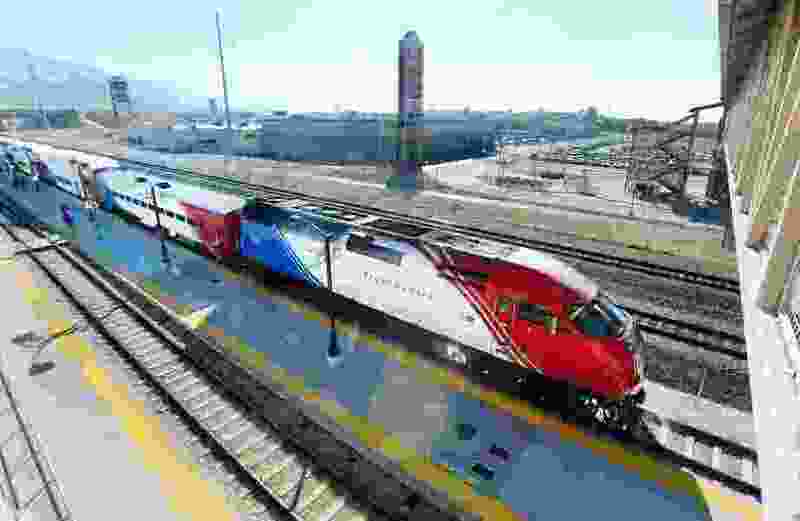 UTA hopes eventually to electrify FrontRunner instead of using the current diesel-powered engines. Such a change would provide environmental benefits and create lighter trains that could accelerate and stop more quickly to allow faster trips. Seager said he does see money for some smaller FrontRunner improvement in the near-term — within the next decade — including a $14 million project to add a FrontRunner station in Vineyard and a $216 million extension of FrontRunner from Provo to Payson. UTA Interim Executive Director Steve Meyer suggested that UTA take some steps that could help the agency better afford double tracking over the long term and be better prepared to qualify for federal grants if opportunities for them arise. For example, he said it may be wise to do more design work to see what property the agency would need to obtain for double tracking. Also, he said UTA may be able to use state corridor preservation money — previously used mostly for highways — to obtain land when it is cheap to save money in the long term.